The finished version, with Cassiel’s lead talisman bringing forth Saturn’s light. I tried this using some loose wire and and LED a few times for “proof of principle” with great results. Then one day while meditating I had a “vision” of my own version of the The Box. This vision would not let me rest. I felt it almost violently clawing it’s way out of my brain and into manifestation, if that makes any sense. Like it was using me as a conduit to come into existence. 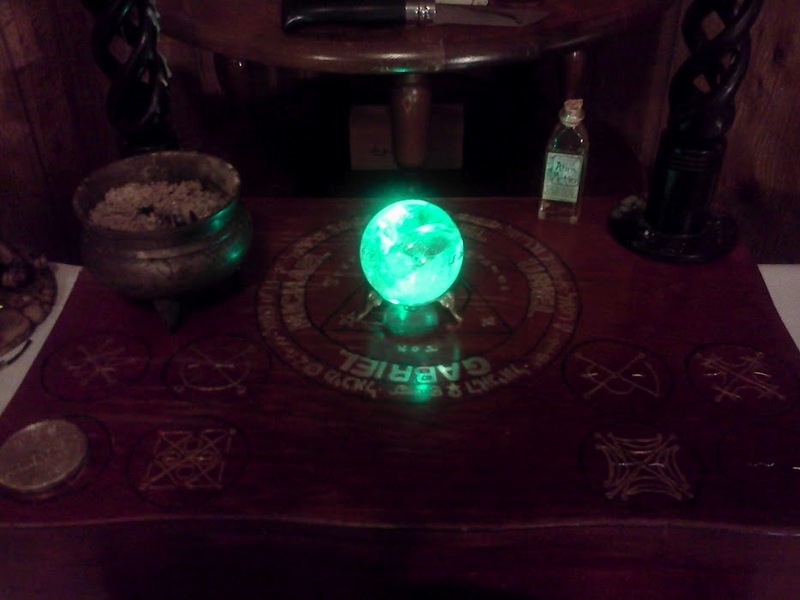 So I made my own version with some modifications, the finished product is shown to the left, with Cassiel’s (Archangel of Saturn) lead talisman triggering the Saturnian light under the crystal. Basically I started out using an old antique flatware case I dug up at the antique shop for next to nothing. 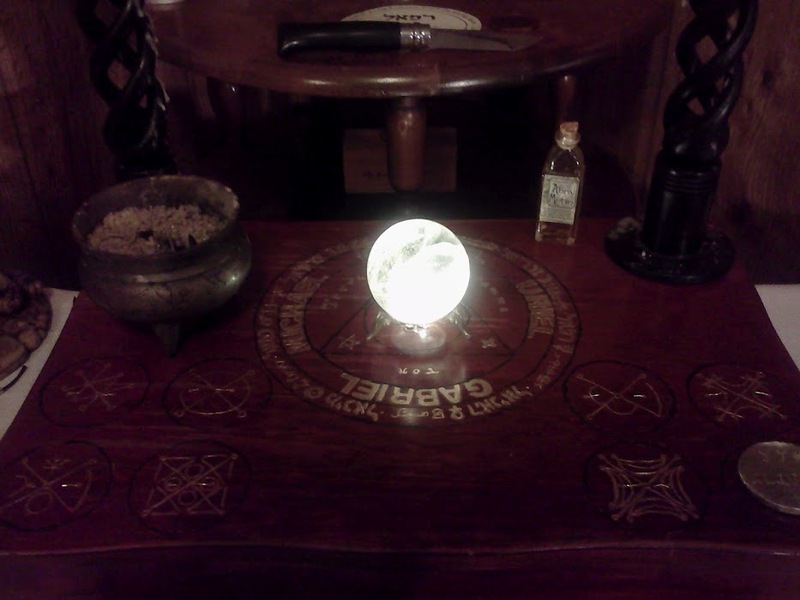 I then engraved a modified version of the Table of Practice on it, and the 7 seals of the planets from Agrippa.The idea was to have it be a one-stop conjuration table/ToP, that I could place my incense burner and candle holders on too. Kind of like a conjuration center piece. 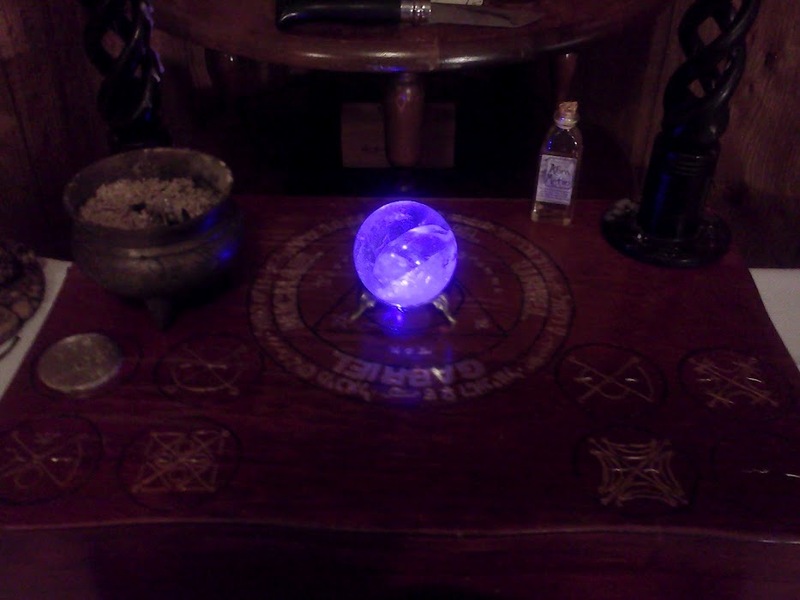 I call it the Conjuration Station (geeky I know, but I like this kind of stuff). For this I used the engraving head of the dremel tool. I find it MUCH easier to work with than a wood burner (albeit louder). There is also an 8th circle for “miscellaneous” spirits that are not planetary in nature. Then I painted it and added the electronics. Basically I drilled 8 holes in the triangle of the table of practice and fit through them 8 LED lights of different colors, each one representing one of the planets. A blacklight for Saturn, blue for Jupiter, Red for Mars, Yellow for the Sun, Green for Venus, Orange for Mercury, and cool white for the moon. I added a warm white light for the “misc” category. The 8 LEDs nested in the triangle, under the crystal. I then connected 8 batteries (I’ll explain why I used 8 rather than just one later) to each light and ran the negative electrodes through each of the planetary symbols on the box. So whenever you place one of the metal talismans I made earlier on it’s matching planetary symbol, it completes the circuit and the crystal lights up with the correct color to be used in evocation. It works pretty much perfect. It’s not going to be “truly” done for about another 7-12 months though. I plan on empowering each battery separately with planetary essence to make it well.. a battery of planetary power. Each battery is going to wrapped in steel wool + lambs wool along with the appropriate metal and soaked in the appropriate oil, and left to sit for a full moon cycle on a small planetary “altar”, of which I am making 7 right now (another vision induced idea). That way when you place a talisman on it, the battery it activates will have pure planetary “juice” running through it, up into the crystal. Also, I have about 10 ounces of pewter left, so I can easily make and engrave a metal talisman for pretty much any spirit I want to work with in about 30 mins for use with this box. I’m also thinking about adding Celestial and Cthonic circles on it (maybe burying the Cthonic battery in a cemetery for a month?). I don’t know, all I know is it’s not finished yet and I’ve just begin to scratch what I think I can do with it. 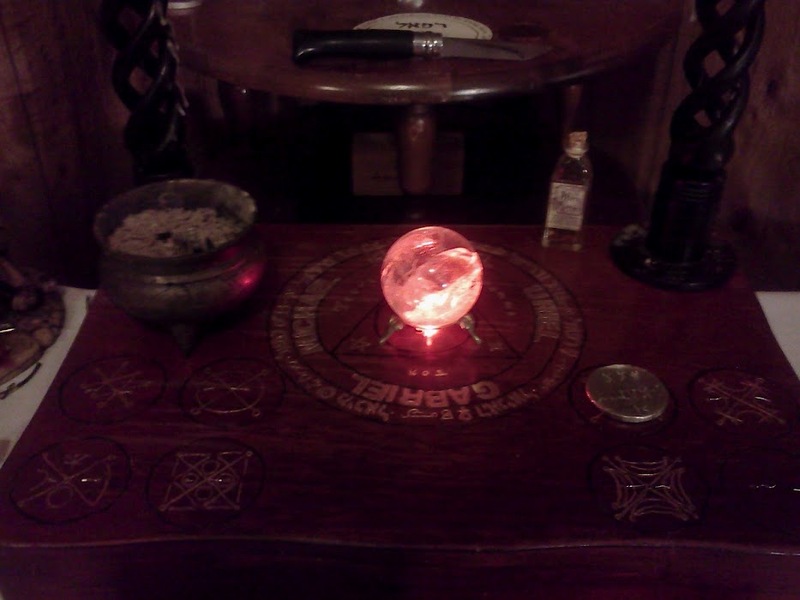 The other night I had a dream about using a crystal skull with the Saturnian light instead of a spherical crystal for Necromantic work (Now I need a damn crystal skull!). Is something like this necessary to to conjurations? Hell no, it’s total extravagance and I fully recognize that. However doing interesting stuff (well to me anyway) like this is part of the reason I like being a magician, so it makes me happy. Here’s a gallery of the crystal lit up with each color. Click on each pic or a larger version. 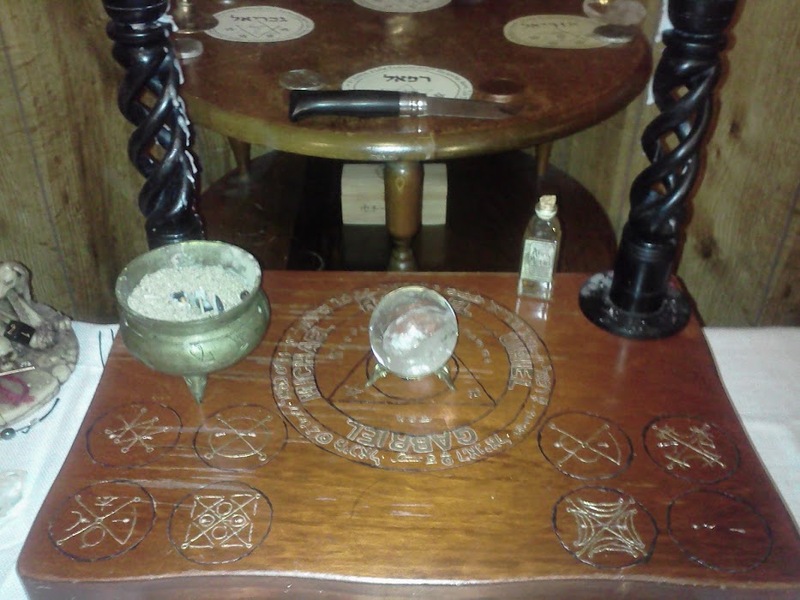 This entry was posted in Ritual Magic and tagged conjuration, Hermetics, scrying, technomagic. Bookmark the permalink. This made me chuckle as I often feel this way about my craft projects or letterings. I can imagine you know the feeling well then! It makes me think that I need to find a way to wire batteries and LEDs into the kavad as I develop that idea further. I had this idea of having seven icons of the planetary powers built into the box walls… maybe wires so that if you placed the talisman of the angel on the icon, you completed the circuit… hmmm. Lots to think about. In any case. Well done, and very cool. Thanks for the link. The box is awesome… but what’s even awesome-er is the way you commented on Polyphanes’ work. The ways we’re grooving on one another’s material is just elegant. This is amazingly badass and shiny. Thanks for sharing. Thanks Satyr Magos! Much appreciated! Other than the planetary charged batteries, why did you opt for separate color LEDs instead of using a multi-color LED that can be set to various colors? 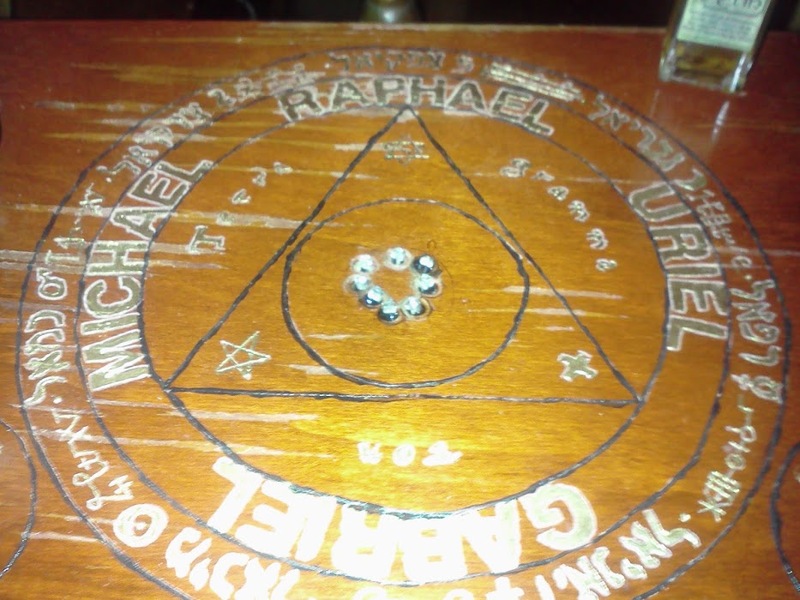 I have a round plaque with a center hole in it (it’s wooden clock piece from Michael’s), I will slightly enlarge the top of the hole to allow my crystal to have a more stable resting spot. 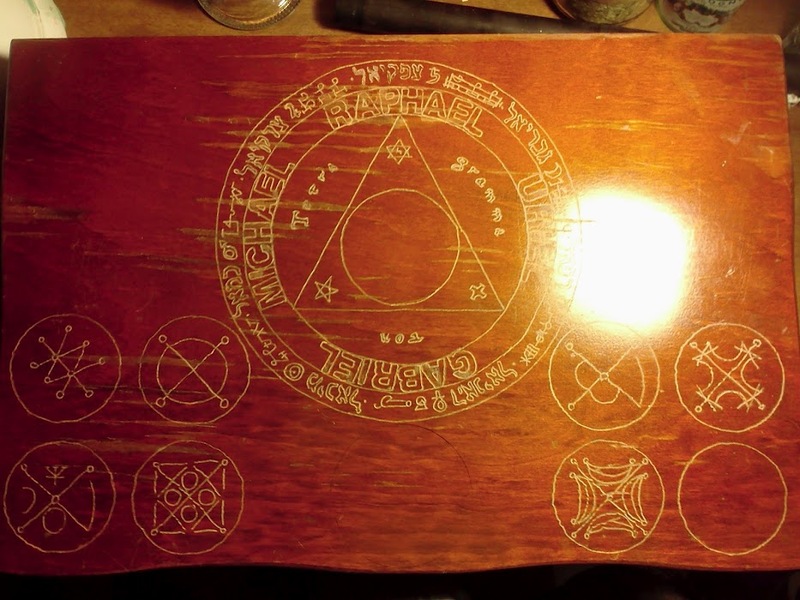 Then I will burn the Table of Practice onto the wood. I will sand out the burnt parts and paint them in. The lighting will be inset into a separate box that will sit under the table, so I can can easily transport the table separately. I’ll probably use a single placement location for the talismans and I may wire in some sort of bypass option for times when I don’t have a talisman. I’ll probably place the battery so that it will drive power through the talisman, so that the energy pushed into the LED comes from a neutral source and then acquires its ‘flavor’ from the talisman. One downside is that I will need to rig up a switch to manipulate the coloring of the light. A much more advanced electronics person could probably tweak it to alter color based on the resistance in the talisman, but that’s way beyond me. That sounds pretty awesome to me! I had thought about doing something similar, using a wood disk from Michaels, for it and hollowing out a section under the disk to hide the battery. Ultimately I settled on the box, but still a cool idea. 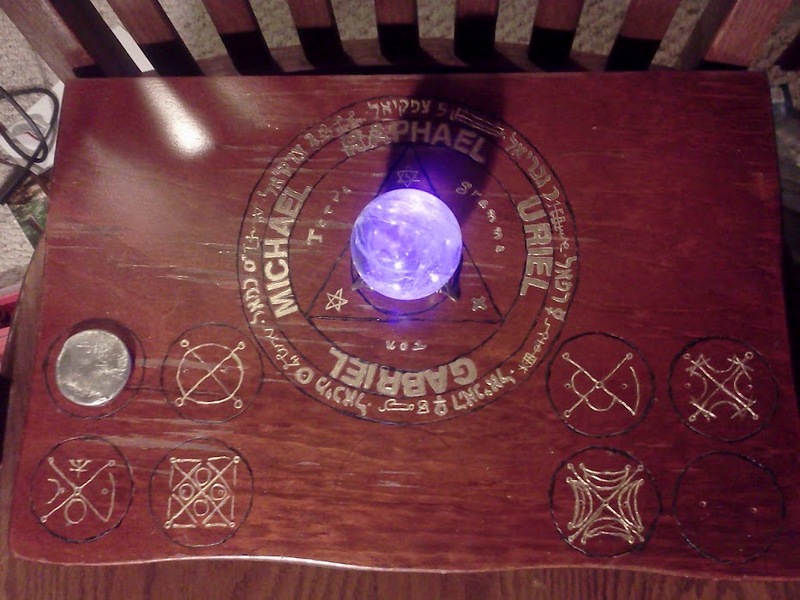 I also thought about using one designated place for the talisman and using a series of 8 switches to turn on and off the appropriate lights (like I said I didn’t know there was a multi-color LED out there!). Whatever you decide to do, good luck! I hope you decided to share it with us if you can. I love seeing stuff like this! Also the link I gave Andrew above might be of use to you. Heh love the idea of the color matching the resistance of the talisman! I’m sure there is someone out there who could do that. Damn, I’d love to see that. This totally rocks! Fantastic use of tech to achieve the magical. Really want to go do crafty stuff now…. Thank you Snaegl! Good luck on your craft endeavors! Thanks so much for sharing this! I’m very new to the world of ceremonial magic, but I’m a big geek and love the way you’ve combined technology and magic. The colored lights are a great idea! This is incredibly impressive, innovative, and beautiful work. Well done! How has it affected your experience of your work with the spirits since you created it? Do you have any notable insights or memories you would care to share?